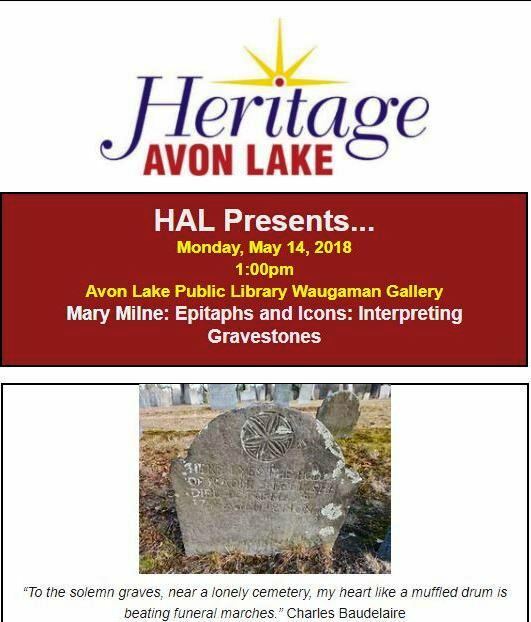 Sharing from Heritage Avon Lake (Lorain County) – Monday, May 14th, 2018 – At 1:00p.m. Mary Milne: Epitaphs and Icons: Interpreting Gravestones | "Limesstones"
“Memorializing the dead with grave markers, headstones and tombstones, family burial plots were marked with rough stones, rocks or wood as a way to keep the dead from rising. The deceased’s name, age and year of death were inscribed. From 1650-1900 square shaped tombstones from slate and sandstone evolved with churchyard burials. During the Victorian era (1837-1901) lavish and decorated gravestones included sculptured designs, artwork and symbols. Marble, granite, iron and wood were popular materials from 1780 to the present. 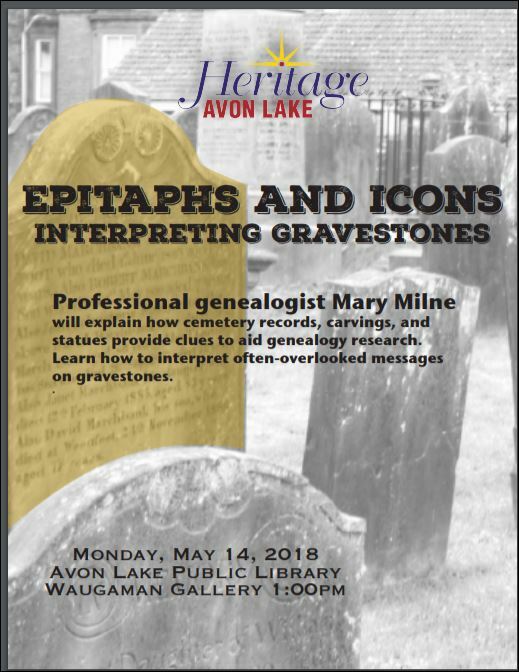 Mary Milne, professional genealogist, presents Epitaphs and Icons: Interpreting Gravestones on Monday, May 14, 2018 at the Avon Lake Public Library’s Waugaman Gallery. She has investigated cemetery records, carvings, and statues that provide clues to aid genealogy research. Learn how to interpret often-overlooked messages on gravestones. All events, which are free, will be held from 1 to 2 p.m. in the Waugaman Gallery at Avon Lake Public Library, 32649 Electric Blvd. This entry was posted in Cemeteries, genealogy, Grave marker, Heritage Avon Lake, Ohio, preservation and tagged Avon Lake, genealogy, Heritage Avon Lake, Lorain County, Ohio, Photographs, preservation, research. Bookmark the permalink.